As Early As The Renaissance Era. I’ve covered many topics when it comes to photography reflectors, but now I’ll focus on the use of a photography reflector to create “north light.” No, you don’t have to point your reflector from a northern angle to your subject to gain this effect, but it helps to know the mechanics behind north light. 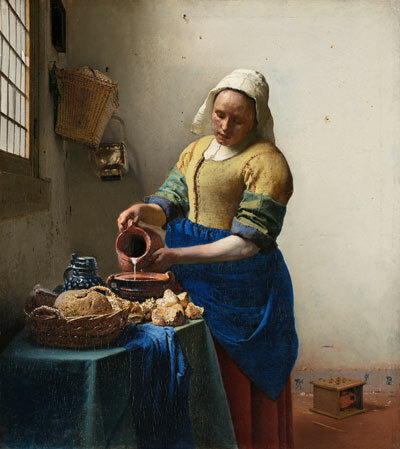 Dutch painter Johannes Vermeer’s painting, “The Milk Maid” utilized the north light effect. I’m not here to debate or ground a theory; I merely want to show the importance that artists from centuries ago recognized the beauty of north light. Most artists (painters) recognize north light as “reflected light or indirect light,” not direct light coming through the window. It’s light already diffused before it enters the window. Note, this is based on Northern Hemisphere shooting whereas in the Southern Hemisphere, south light is the better beauty light. Either window, depending on your location on the hemisphere, also allows for the longest amount of time light will enter that window throughout the day since the sun rises from the east and sets in the west. This also means that the color temperature of the light coming through the window is similar to light in open shade, or a cool color temperature between 6000 to 7000 Kelvin (K). Personally, I shoot with manual white-balance settings on my camera, usually 6000K, so I’m not going to worry about this small color shift, though I’d recommend you that you do a custom white-balance, or at least set your camera to 6000K manually or use your camera presets of shade, or the cloudy day settings. Now imagine you have access to a portable window with diffused sunlight shining through its glass; no matter where you place that window, it’s your main source of light for your subject. Window light is one of the “beautiful” light sources there is, as it’s natural light (sunlight) “filtered” through glass that creates ambient or existing light paths. Now we all know that sunlight doesn’t move with a window, hence why many photographers look for studios, or locations, that favor north light. But we’re not all that lucky to have studios, or shooting locations, with north facing windows, and this is where your SUNBOUNCE PRO photography reflector comes in handy, specifically with the white fabric. Consider the white fabric the best fabric to create the feel of north light. Windows that face north, provide a natural north light effect, similar to the white fabric of a photography reflector. In fact, another Renaissance painter, Leonardo da Vinci, was known for his realistic paintings and interestingly, one of his most famous paintings, The Last Supper, was painted on the north wall of the refectory of the Convent of Santa Maria delle Grazie church. Leonardo not only used techniques like chiaroscuro and sfumato, but he relied heavily on soft, subtle, and gentle lighting in his most famous paintings, including the Mona Lisa. Now obviously this technique of recreating the effects of north light means a low-powered, or low-intensity source of light, as white fabric reflectors are not as powerful as using silver, or zebra fabric reflectors like those offered by SUNBOUNCE. So, the key in using the white side of a reflector is to understand your background, as your camera will have to expose for your subject’s skin tone. The best solution is to look for darker backgrounds, perhaps dark foliage, because in essence, you will more than likely overexpose your background, by default, especially if you consider the Sunny 16 Rule when shooting outdoors. Thus, if your background is dark, and not a plain sky or highlighted background, only you the photographer will know that the dark green leaves are brighter, in the case of foliage in your background, vs. what your eyes truly saw during your photo shoot. Often this can add mood to your photographs especially when capitalizing on bokeh through the use of a wider aperture, or lower f/stop value, such as f/1.4, f/1.8, f/2.8, etc. Many great painters, as well as photographers, use this bokeh, or lack of depth of field effect, as the primary focus is your subject, not the background. (1) The larger the light source, or reflector in this case, the sweeter or more flattering the light is to your subject, hence why I prefer the larger SUNBOUNCE PRO photography reflectors which mimic a standard sized window. (2) Reflectors do not “amplify” light striking its reflective surface, reflectors only redirect light where the photographer wants it to fall and in the case of the white fabric, a reflector slightly diffuses the light in addition to reflecting the original light source. Fortunately, with digital cameras today, you can utilize higher ISO’s without the digital noise from older digital cameras as well as from yesterday’s film days where high ISO film speeds produced grainy photos. So, if you want to mimic the beauty of the old Renaissance masters of art, consider the white fabric of your reflector as a main source of beautiful north light.